By default, the Web proxy is enabled to direct traffic to Guardian for content filtering. Traffic is automatically routed through the first internal interface. For a detailed description of how to change this, see Using a Built-in Script. 1. Go to Web proxy > Web proxy > Settings. 2. To disable the Web proxy, select Disable for Guardian in the Global option panel. All file uploads are allowed. All file uploads are blocked. Files below the size specified are allowed. • HTTP strict mode — This option determines the web proxy's behavior when processing HTTP/1xx response codes; specifically, response code 100 Continue. When HTTP strict mode is enabled, the web proxy does not forward responses with an Expect: 100 Continue header to the client. Although this is an HTTP protocol violation, some client applications have been found to not function correctly when such responses are forwarded. The default behavior is where HTTP strict mode is disabled, therefore the web proxy always forwards responses with Expect: 100 Continue headers to the clients. • Block advanced proxy bypass attempts — Proxy avoidance services, such as Ultrasurf, ,may be used to bypass Guardian. With this option enabled (default behavior), such services are blocked when the initial connection is detected, and a 15 minute partial ban enforced for the user who made the attempt. Whilst the bypass client is open and attempting reconnection, all traffic is blocked. If the client is closed, most traffic is allowed during the ban, but any domains that do not use Server Name Indication (SNI) to identify themselves remain blocked. This may result in some legitimate sites being blocked for the remainder of the ban, as without SNI, proxy bypass services are indistinguishable from legitimate traffic. You can create a custom report to view the connection attempts — ensure the Ultrasurf IPs reporting section (found under Guardian) is included. For a detailed description of how to create a custom report, see Creating Custom Report Templates. • Resume interrupted NTLM connections — By default Guardian resumes interrupted NTLM connections caused by non-standard web browser behavior. If restrictive Active Directory account lockout policies are in place, disable this parameter. • Resolve single component hostnames — By default, Guardian makes no attempt to interpret single component hostnames which are not fully qualified. Disable this parameter to stop from trying to interpret single component hostnames which are not fully qualified. • Server persistent connections — By default, Guardian enables server persistent connections. Disable this option if experiencing 502 Bad gateway errors when accessing some websites. • Via headers — By default, Via headers are used to trace, for both the request and response, the proxies a connection has been made through. Guardian web filter will add its own entry into the Via header, as well as the header added by Squid. Some websites may attempt block users browsing through a proxy. Disable this option to prevent the addition of headers by both Guardian web filter and Squid. • Honor incoming X-Forwarded-For — If enabled, Guardian can take the client IP address from the X-Forwarded-For header, inserted by downstream proxy or load balancer. Using the IP address contained within the header clients can than be identified within the Smoothwall. Note: Do not enable the Honor incoming X-Forwarded-For option if you have enabled Leak client IP with X-Forwarded-For headers with an upstream proxy, or with client IP address spoofing. • Allow access to web servers on these additional ports — By default, Guardian only allows requests to servers running on a certain subset of privileged ports, that is, ports below 1024, such as HTTP (80), HTTPS (443) and FTP (21). If you require access to servers running on non-standard ports, enter them here. • Proxy logging — We recommend that you disable this option when Filter logging mode is enabled. This is because Guardian proxy logs are effectively duplicated subsets of Guardian web filter logs. Disabling proxy logging can lead to improved performance by reducing system storage and processing requirements. • Organization name — Enter a name which can be used to identify Guardian in your organization. Organization names are also referenced in certain web reports. Select this option to generate proxy logs with all recorded data. Select this option to generate filter logs with anonymous username and IP address information. Select this option to disable content filter logging.elect to disable the logging of the types of browsers used by users. • Client hostnames — Select whether to record hostnames of computers using Guardian. When enabled, web filter data incorporating hostname information can be generated. It is important that DNS servers exist on the local network and are correctly configured with the reverse DNS of all machines if this option is enabled, otherwise performance will suffer. • Client user-agents — Select whether to record the types of browsers used by users. • Advert blocks — Select whether to log information about advert blocking. • Local accesses — Select whether to log local accesses made through the web proxy to either localhost, or IP addresses 127.0.0.*. Typically, these accesses are logged. However, some configurations may cause clients to swamp the log files, in which case, you can turn off this logging. • Global cache size — The size entered here determines the amount of disk space allocated to Guardian for caching web content. Web and FTP requests are cached. HTTPS requests and pages including username and password information are not cached. The specified size must not exceed the amount of free disk space available. The cache size should be configured to an approximate size of around 40% of the system’s total storage capacity, up to a maximum of around 1.5 gigabytes. Larger cache sizes can be specified, but may not be entirely beneficial and can adversely affect page access times. This occurs when the system spends more time managing the cache than it saves retrieving pages over a fast connection. For slower external connections such as dial-up, the cache can dramatically improve access to recently visited pages. • Max and min object size that can be stored in the cache — Enter the largest object size (Max object size) that will be stored in Guardian’s cache. Any object larger than the specified size will not be cached. This prevents large downloads filling the cache. The default of 30720 kilobytes (30 MB) should be adjusted to suit the needs of your users. Enter the smallest object size (Min object size) that will be stored in Guardian’s cache. Any object smaller than the specified size will not be cached. This can be useful for preventing large numbers of tiny objects filling the cache. The default is no minimum – this should be suitable for most purposes. • Max object size that can pass in and out of proxy — Enter the maximum amount of outbound data (Max outgoing size) that can be sent by a browser in any one request. This can be used to prevent large uploads or form submissions. The default no limit. Enter the maximum amount of inbound data (Max incoming size) that can be received by a browser in any one request. This limit is independent of whether the data is cached or not. This can be used to prevent excessive and disruptive download activity. The default is no limit. • Do not cache these domains — Used to specify domains that should be excluded from the web cache. This can be used to ensure that old content of frequently updated web sites is not cached. Enter domain names without the www prefix, one entry per line. • ICP server — Turn on to allow ICP compatible proxies to query Guardian's cache. ICP is a technique employed by proxies to determine if an unfulfilled local cache request can be fulfilled by another proxy’s cache. ICP-enabled proxies work together as cache peers to improve cache performance across a LAN. ICP is recommended for LANs with multiple Guardian proxy servers; non-Smoothwall proxies must use port 801 for HTTP traffic. • ICP server IP addresses — Use this area to enter the IP addresses of other ICP-enabled proxies on the LAN that Guardian should query. Use in conjunction with the ICP server option enabled to allow two-way cache sharing. 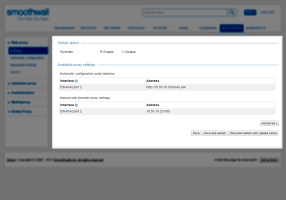 • Direct Return Server Virtual IP — If you Smoothwall solution makes use of a load balancer, add the virtual IP address here. This must be the virtual IP address assigned for communication to the Smoothwalls in the cluster, not the actual IP address of the load balancer. You must ensure this virtual IP address does not respond to ARP queries as ARP-ing behavior is what sets this type of virtual IP address apart from a simple alias. By default, Guardian comes with a comprehensive set of web filter policies and an authentication policy which you can use immediately in order to protect your users and your organization. The following section explains how to use these policies to get web filtering up and running quickly. Tip: Browse our Knowledge base and read about Windows SSH initial setup considerations, testing and refining filter settings and tips on content filtering. 1. On users’ computers, configure the web browser to use port 800 on Guardian as the web proxy, that is, non-transparent proxying. 2. Go to Web proxy > Web proxy > Settings. 3. Check that the Guardian option is enabled. 4. Scroll to the bottom of the page and click Save and Restart. Guardian starts to provide web security. You can edit the default policies and create new policies to suit you organization. For more information, see About Guardian Policies.